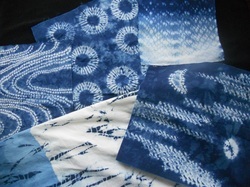 Shibori is the Japanese art of making shapes and patterns on cloth using stitching, tying, folding, and clamping. This class will explore many different traditional and contemporary techniques and use indigo for dying to produce beautiful designs on cotton fabric. We will also dye a silk scarf using shibori methods and silk dyes. 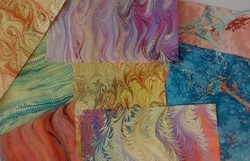 Learn the ancient art of marbling on fabric and paper. Create swirling patters on fabric using carrageenan and acrylic paints. Experiment with various tools to manipulate the paint to create flowers, stones, and non-pareil designs. Join Rebecca Kemble and Rebecca Loew in this 3-day workshop, as they take you through the basic techniques of low water immersion dyeing, discharge, screen printing with thickened dyes, shibori and indigo, stamps, stencils and a touch of bling! Fun for beginners and more experienced designers. Day one: Layer number one. Low water immersion dye, deconstructed screen print. Day three: final layer. Indigo dye, over-dye, stamp, paint, and add metal leaf to your pieces. This trunk show and lecture explains the art of Shibori, the variety of methods, and its uses in the textile arts. Works of my own and some from Japan will be displayed and discussed.